St John’s College enjoyed a profitable pre-season trip to Zimbabwe ahead of a busy 2018-19 schedule, writes THEO GARRUN. 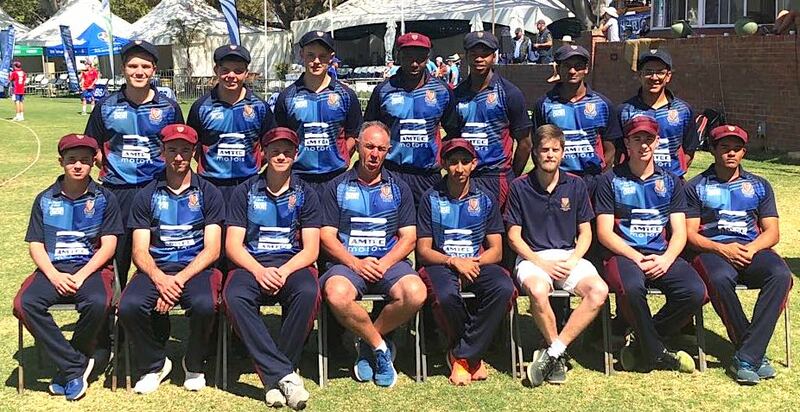 St John’s College went to Zimbabwe in the holidays to play in the St George’s T20 tournament and, according to their first team coach and master in charge of cricket Adi Norris, it was well worth the effort. ‘We find it’s a great way to get the season rolling. You play a lot of games in a short period of time and, although the standard’s not that high, and it’s not everyone’s favourite format of the game, it gets everyone into the swing of things,’ he said. St John’s met fellow Joburg school St Benedict’s in the final and ended up losing a nail-biter by four runs. 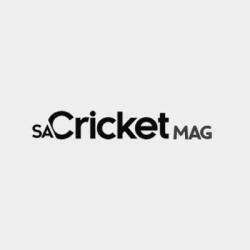 There were a number of St John’s boys who shone on tour, including Jack Lees, Connor Esterhuizen, Clayton Pather, Nick Halstead-Cleak, Amish Kooverjee, Sam Rivisi and Kabelo Mokanye. Esterhuizen was top run-scorer with 395 runs, while Lees got 259. 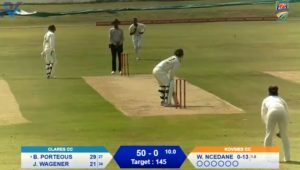 Esterhuizen and Amish Kooverjee both scored centuries … in T20 games! Jack Lees took 17 wickets and Clayton Pather nine. The Joburg boys schools season officially gets under way on 6 October, but St John’s will be very busy before then. Their U14s will be playing in festivals at Trinityhouse and Noordheuwel, the U17s go to Michaelhouse for a festival and the first team will be at the Michaelmas Festival in Pietermaritzburg where they will be playing against St Charles, DHS, Maritzburg College and Grey College. Then it’s into the official season with St Stithians up first, on 6 October. St Georges 109 (Clayton Pather 2-22, Kabelo Mokonyane 4-27, Jack Lees 3-20). St John’s 110-0 (Hayden Israel 32 not out, Nick Halstead-Cleak 60 not out). St John’s won by 10 wickets. Peterhouse 120-7 (Clayton Pather 2-14, Jack Lees 3-26). St John’s 121-6 (Connor Esterhuizen 50 not out). St John’s won by four wickets. Churchhill 132 (Kabelo Mokonkyane 2-14, Jack Lees 3-29). St John’s 135-3 (Connor Esterhuizen 68, Jack Lees 34 not out). St John’s won by seven wickets. St John’s 208-5 (Amish Kooverjee 92 ). CBC Bulawayo 140-6 (Clayton Pather 3-14). St John’s won by 68 runs. CNC Bulawayo 74 (Jack Lees 3-3, Saml Ruwisi 2-14). St John’s 80-1 (Nick Halstead-Cleak 28 not out). St John’s won by nine wickets. Prince Edward 180-6 (Sam Ruwisi 2-28, Jack Stewart 4-33). St John’s 181-5 (Nick Halstead-Cleak 64, Jack Lees 67). St John’s won by five wickets. Falcon 195-6. St John’s 199-2 (Nick Halstead-Cleak 97 not out, Amish Kooverjee 42, Connor Esterhuizen 35). St John’s won by eight wickets. St John’s 249-2 (Amish Kooverjee 105 not out, Connor Esterhuizen 108). Peterhouse 113 (Jack Lees 2-27). St John’s won by 137 runs. St John’s (Harare) 170-7 (Ethan Van de Merwe 4-33). St John’s 171-6 (Amish Kooverjee 59, Jack Lees 74 not out). St John’s won by four wickets. Final: St Benedict’s 172-7 (Kyle Saxby 38, W Saxby 38; Clayton Pather 2-21, Jack Lees 3-22). St John’s 168-6 (Connor Esterhuizen 67 not out, Clayton Pather 43; Kyle Saxby 2121). St Benedict’s won by 4 runs.